I saw this video recently and I’m not exactly sure why I got such a kick out of it, but certainly this 109 year old is a living example of a few simple lessons, such as being connected to a community, giving and enjoying simple pleasures. There is a lot of debt, as in people that owe money to someone else, in the world today. Of course, in the modern world, it’s pretty normal. We borrow from a bank to buy a car or house. We use a credit card to buy stuff. We receive services like TV, electric and water. The usual thing is that the lenders or providers of these things want to be paid back with money and often with some extra money for their trouble. So, here is a question. How do you feel when you pay back these lenders and providers? Whether you are financially tight or have more than enough, I think how you feel and think when you pay these people back can have a big impact on YOU. Your energy towards your financial abundance can be a part of or attracting more or repelling it. If you have plenty of money and your always cursing your bills, I’ll promise you your overall abundance will be limited in some way outside of your financial abundance. Same with if your financial abundance is not where you want it to be. Paying back you bills with a more positive attitude (remember, you received some stuff you bought) or at least a lighter way of thinking will really help that stress level that we all can get around bills. Make it a game if you can, celebrate paying off a bill. I often will advise people to make paying bills off a choice. You do not have to pay the electric bill if you do not want to, right?………Your house might be awfully dark at night if you keep choosing that. However, notice the subtle difference, in saying I’m going to choose to pay my electric bill this month and choose to eat at home an extra night (with the lights on) instead of eating out. You may think this is mind games or too simple, but I feel there is huge power in choice and feeling good about how you are feeling while paying your bills. Here is another way at looking at debt from the book, “You can have it all” by Arnold Patent. So, my next personal goal, love the IRS:)!!!!!! From a book called, How many people does it take to make a difference? One! ….They call you a dreamer, a do-gooder or a romantic. every time you stand up for a good cause-large or small-someone will roll their eyes or tell you yo sit back down. Robert Kennedy used to say that 20% of the people are against everything all the time. It’s true. There will always be lots of people who can give you all the reasons why you can’t or won’t improve the world. It’s up to you to remind yourself of all the reasons you can and will. Optimism and pessimism are both choices. Notice that some of the most interesting and successful people have chosen to acquire the habit of talking about what they are for rather than what they are against. Be one. A friend sent this to me. I think it’s great. Best to stay in the only “business” we can truly control which is our business. The miraculous rescue of the Thai soccer team this past week left many of us wondering: How did those 12 boys manage to stay so calm while trapped in a cave for over two weeks? One answer is that their 25-year-old coach, a former Buddhist monk, reportedly taught the boys to meditate, to help slow their breathing and quiet their nerves. He credits the practice with helping them to ride out the long days of confinement and discomfort. One particularly effective technique that they are likely to have tried is mindfulness meditation, a practice widely used in Thai Buddhism. Practitioners train their attention on the present moment, dispassionately observing their thoughts and feelings without judging or reacting to them. “For the boys trapped in the cave, practicing mindfulness could have helped them stay calm in a very stressful situation, by keeping them focused on the present rather than fretting about the past or worrying about what might happen in the future,” says mindfulness researcher Kristen Lyons, an assistant professor of psychology at Metropolitan State University of Denver. Dr. Lyons points to research on adults that suggests practicing mindfulness helps people to stay centered in moments of stress. It dampens our fight-or-flight response, so that we can respond to emotional situations constructively rather than reactively. Our children may never know the terror of being stuck in a cave, but all of them will have moments of feeling trapped and threatened, whether it’s taking a math test or dealing with a bully on the playground, says Amy Saltzman, a holistic physician and mindfulness coach in Menlo Park, California. 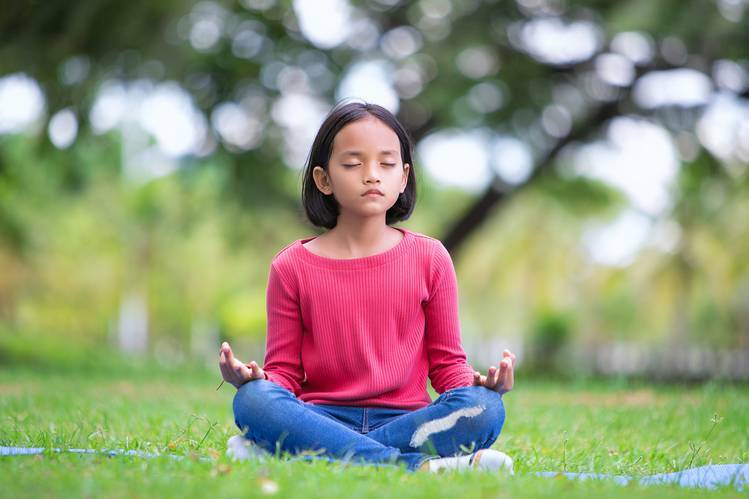 “With mindfulness, the intention is to have your feelings—whether it’s sadness, fear or anger—without those feelings having you,” says Dr. Saltzman. Even toddlers can be taught how to be mindful. A good place to start is with a feelings meditation. Begin by lying down together and bringing the child’s attention to their breath. Place a small object on their stomach and have them notice how it goes up when they fully inhale and down when they fully exhale. Next, help them to label what they’re feeling, and ask them to notice where those feelings manifest in their body: Is there a warmth in their chest, a pain in their head or a tight feeling in their stomach? Explain that mindfulness is not about erasing those bad feelings but about acknowledging them, even befriending them, and then choosing how we respond. Teenagers can start by downloading apps like Insight Timer, Headspace or Calm, which offer guided meditations. You can explain how mindfulness will help them respond to stressful situations in ways that will make their lives simpler and make them less likely to be buffeted by events. It will leave them with less of an emotional mess to clean up later, says Dr. Saltzman. Even moments like putting on shoes, taking a shower or brushing teeth can serve as informal practice in mindfulness. For example, ask children to pay attention to how it feels when they squeeze the toothpaste tube, how the toothpaste tastes in their mouth and the sensation the bristles make on their teeth and gums. Families can carve out small moments to be mindful together, says Dr. Lyons. At dinner, pay attention to those first few bites of your meal, or when you’re all walking to the car, notice how the sun feels on your skin. Be aware of moments of distracted parenting, too. When you greet your children in the morning and before bed, practice being fully present for 15 minutes without distractions: no electronics, no cleaning up, no making a to-do list. The more we incorporate mindfulness into our daily lives, the better it will serve us when we need it most. For some of us perhaps, it may also be a lifesaver someday. Byron Katie’s work, what she calls “inquiry”, has been one of my favorite tools for questioning my thoughts or another way to look at it is questioning my beliefs. I really think her work and the general work of questioning your thoughts is priceless for greater freedom from our minds that think all sorts of crazy things. We certainly can’t control what we think, but we have the choice to believe them or not. Some of her quotes below give a lit insight into her philosophy. Check out her u tube talks if your interested or go to http://thework.com.